Between my husband & I we have a lot of pens, brushes and markers. It seems like we're always losing them too. I found these metal containers before Christmas to plant holiday bulbs in but I liked them so much I bought more for all our pencils & stuff. Also, I can't remember if I shared these rubber string hangers but I love them. They're from Kontextur and come in different sizes and shapes. 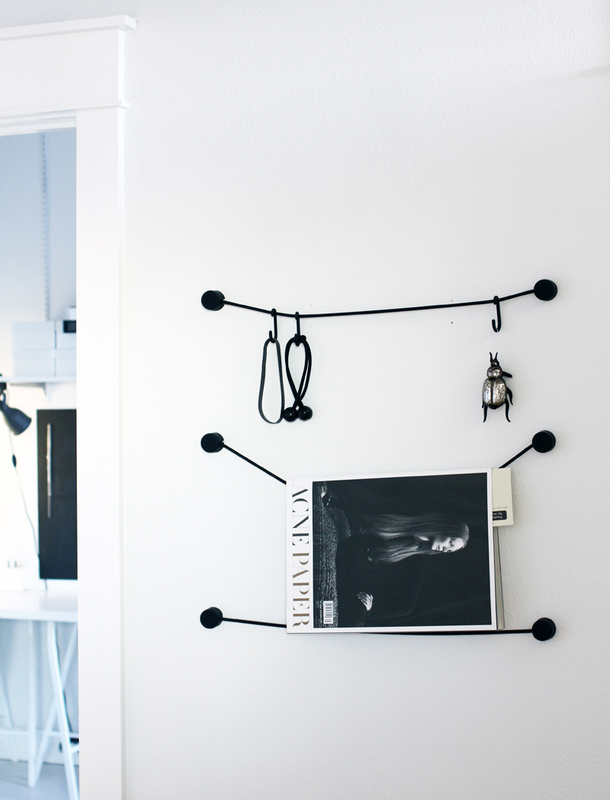 I like how simple they are and perfect for holding the magazines and papers I don't want to put away yet. P.S. you can find the hangers here, in my friend's shop! 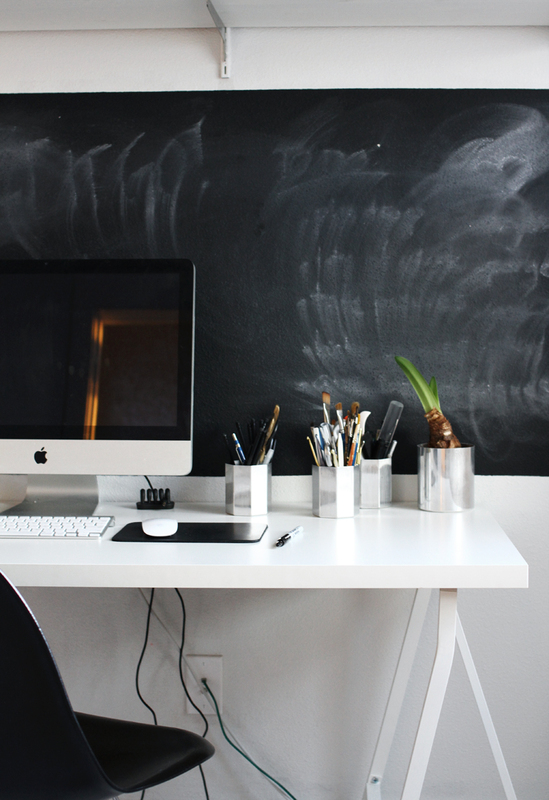 Is that a chalkboard-painted wall behind your desk? I love it! loved those metal container. And the blackboard behind desk is so awesome, a perfect contrast for your theme. New follower. I love those pen tins! Where did you get the pen/pencil holders? They match some mini ashtrays I found at a thrift store. Anyway, beautiful! The tin cans are brilliant! Oh! So happy you shared the hangers: I saw them in your Instagram and couldn't get them anywhere. Your office space looks so modern and beautiful. I love the hangers, so unique! Did you see this cool retro appartement in Stockholm? Love it! Those hangers are pretty awesome. Our bed is up against one wall so I don't have a night table. I could see one of these being great for holding magazines and books. The price is pretty good too. Just checked out the site. Hi. Can you share where you got the metal pencil holders from? Absolutely adore them! oh my god ! 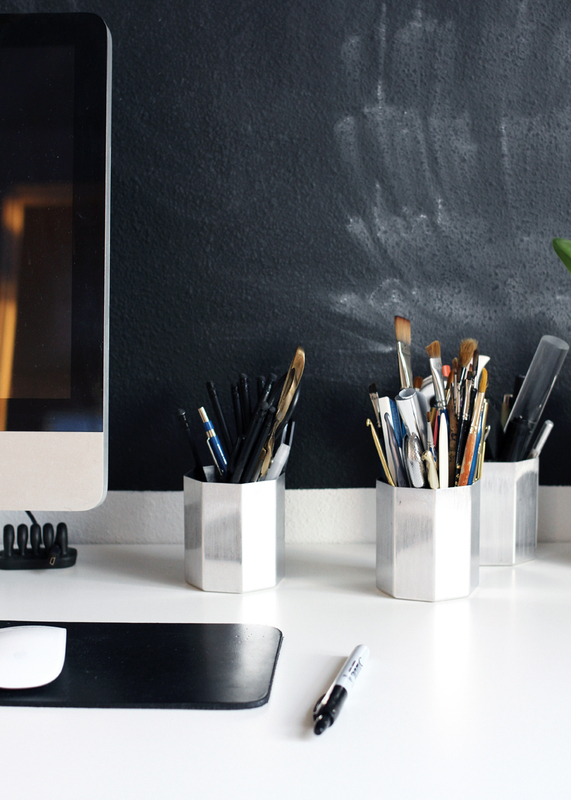 that metal pencil holder is to die for ! could you share where to get it?